This comprehensive educational psychology book blends a strong scholarly and theoretical background with the application of theories and concepts using real-world examples, case studies, and practical teaching strategies. The text&#x2019;s innovative pedagogical program is anchored by a cohesive learning objective system integrated throughout each chapter, guiding your reading and reinforcing your understanding of concepts. 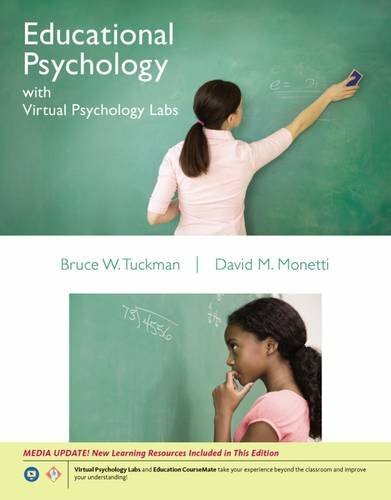 This edition includes access to the book&#x2019;s website, Education CourseMate, where you can participate in Virtual Psychology Labs. Introduced in the text, the labs illuminate key experiments that are not easily explained in a book or demonstrated in the classroom. These first-hand research experiences allow you to gain a better understanding of the experiments&#x2019; methodologies, conclusions, and implications. TeachSource Video Cases, introduced in the text and available at CourseMate, allow you to view real-life classroom scenarios that demonstrate teaching applications and best practices. Among other distinctive aspects of the text are an entire chapter on group process and a unique &quot;Think It Over&quot; feature that asks you to reflect on important topics as both a student of psychology and a future classroom teacher. SECTION I: EXPLORING PSYCHOLOGY'S ROLE IN EDUCATION. 1. The Study of Educational Psychology. SECTION II: DEVELOPMENTAL TRENDS AND LEARNER DIVERSITY. 2. Cognitive and Language Development. 3. Moral, Personal, and Psychosocial Development. 4. Learner Diversity. 5. Learners With Exceptionalities. SECTION III: LEARNING APPROACHES AND APPLICATIONS. 6. Behavioral Approaches to Learning. 7. Cognitive Approaches to Learning. 8. Constructivism, Problem Solving, and Creativity. SECTION IV: THE TEACHING-LEARNING ENVIRONMENT. 9. Group Processes in Instruction. 10. Motivating Learners. 11. Effective Learning Communities. 12. The Design of Instruction. SECTION V: APPRAISAL OF LEARNING. 13. Classroom Assessment of Student Learning. 14. Standardized Assessment and Grading.